Safety is a must for any institution, especially hospitals. It’s important to keep track of every item that goes in and out of a hospital. The Hospital Inventory List can help you organize that information, whether you’re a small practice or a large facility. You can enter the item and quantity information you have on-hand and print the document for your extended use. Now you can go about your day with confidence, knowing everything is exactly where it should be, download this free template today to get started. The first step will be to download the free template file to your computer by clicking the link provided at the bottom of this page. Once you have the document open, you’ll need to change the pre-written items to things that are more common for your office. You can see the Hospital Inventory sheet uses a “Product Code” system and features more details with Vendor code, Description, etc. To change these items to fit your own system, simply click the cell and write a new category instead. When you have your new system set, you can either enter your items on your computer or print the sheet out to write them down by hand. You will enter the “Product Code” or whatever system you want to use, followed by the quantity of that item you have in hand. You can continue down the list by entering the unit price for your item and the status it’s currently in. Let’s say the item is something you need to keep in cold storage, you can list that fact in the “Status” section to help you organize your inventory better. You’ll also notice a section below the “On-hand” cell that gives you the option to list the “Min Quantity.” This is simply a way for you to write down a required amount your office needs to have on hand. If you see that your current stock is reaching that figure, you can easily order more. 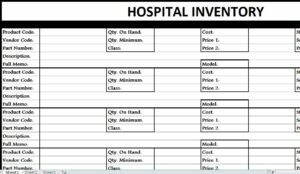 Your hospital facility will run more smoothly and efficiently by using the free Hospital Inventory List to keep track of your items.